With the arrival of the new month comes a renewed vigour to update the house. The air feels cooler and the children are marching back to school. The house feels empty now and I’m full of ideas on what to decorate first, particularly as the builders are here now and the attic conversion is in full swing. Bedrooms are on my mind. How to decorate them, what are the current new looks, and how to save the pennies and give the room a thrifty revamp. With that in mind, I’ve come up with some of my favourite creative ways to decorate your bedroom this Autumn. I’ve long been a fan of the US DIY blog Vintage Revivals. I love Mandi’s style and her makeovers and DIY projects are just stunning. She inspires me to give it a go, even when I know I’m not really cut out for it. I recently found this amazing vintage dressing table in a local charity shop for just £30 and plan to give it a makeover with spray paint, copper knobs and some incredible wallpaper in the drawers. I’ll be sharing it next week, but seriously, if I can do it anyone can. It’s always worth tackling a makeover project to keep the overall cost down, and to give your home a unique, personal feel. The bed is often the feature point in any bedroom and as such needs to look the part. Give plenty of thought to how you dress the bed from the duvet cover and sheets, to the pillows, cushions, throws and bedhead. It needs to be comfortable and practical as well as sumptuous and luxurious. Buy the best you can afford and keep the covers fresh and well laundered at all times. I’ve been taking a little inspiration from a company called Button and Sprung who have the most extensive range of beds in a myriad of colours too. Their imagery (above) is wonderful and gives me lots of ideas for colour combinations particularly in the upholstered beds section. I love how we don’t need to hide bed bases under a valance sheet anymore but can let the beautiful fabrics shine through. I can’t wait to dress the new bed in the attic and have a little pile of sheets and throws stashed away all ready for the big day. I’ve recently been inspired to embrace plants in the home more than I have in the past. When I was growing up my Mum always had cheese plants and tall rubber plants growing in the house, and one of my weekly chores was to water them. I used to keep plants a lot in previous houses, but since the children came a long I’ve lost interest (and had one too many potted plant disasters!). Well, since I made my own DIY succulent and cacti plant pots a few weeks ago I’m hooked again. I’m desperate to get some in the bedroom once the attic in converted; it’s such a great way to breathe life into your decor. Last week was Day of the Orchid (more about that in another blog post) and these stunning plants make an incredible impact on contemporary interiors. So there are some of my creative ways to decorate your bedroom this Autumn, what will you be doing to revamp your home in the coming months? Lovely ideas. 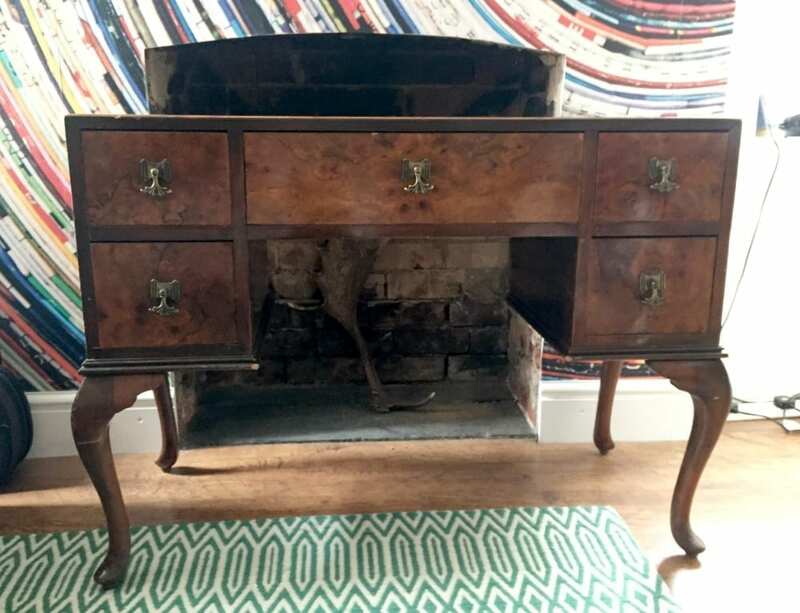 What a fabulous vintage find in the dressing table – can’t wait to see the makeover. 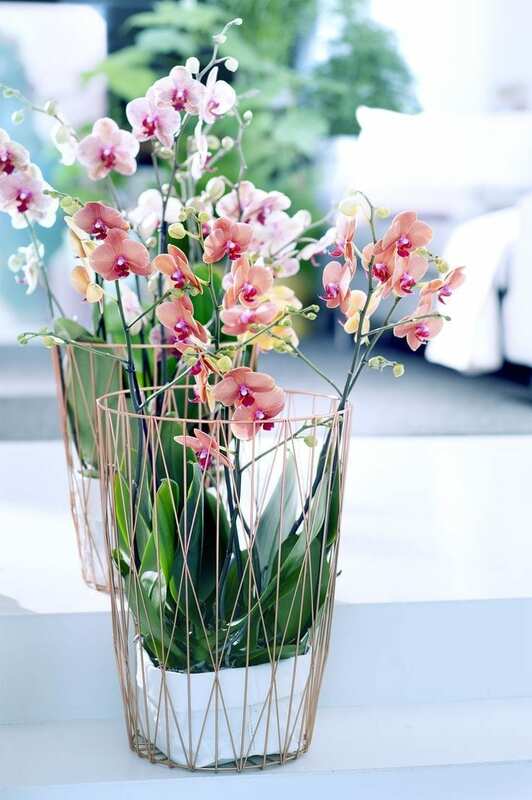 I love the image of the orchids in those wire baskets – I just repotted mine and took cuttings last weekend, but you have inspired me to think of nicer ways of displaying them! Best of luck with the attic makeover. Some great ideas. I love that bed and the linen in grey tones. I will be revamping my living room this Winter. Great tip about the bedheads and upholstery. This can truly help redesign some of our rooms. Plants at home is also a pretty much “a must” for me too. We live in apartments and every so often our neighbors will drop off something near the trash. An easel, a computer, a desk, a bird cage, the list goes on…even plants that are living and healthy. It’s free and it is better than adding to the waste piles! Warm tones like deep reds, oranges and yellows are ideal accent colors throughout the autumn months. These colors produce a welcoming atmosphere and make the area seem warmer. Cool tones include shades of blue, white, light greens and perhaps pastel purple. These can supply as accent colors during the warm summertime to create the illusion of the cool atmosphere as your guests step into your house. Have fun choosing colors for the home, and enjoy the calming and inspiring atmosphere they produce! Really very nice ways you share to decorate home. very thanx for this sharing. thanks for sharing these cool tips to decorate the bedrooms. I just love to decorate my bedroom. I always try too find new decoration ideas. I love putting plants around my house too. In the bedroom, I suggest putting a pot of lavender because it can help you sleep easier.